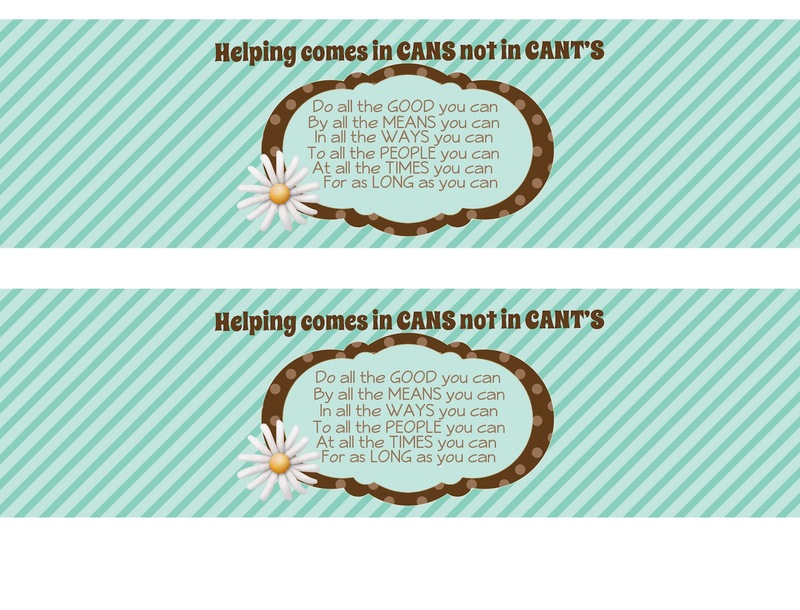 First was this great handout idea about doing all you "can". She made a label and attached it to a soup can. I would take it one step further and make that can into a treat can. 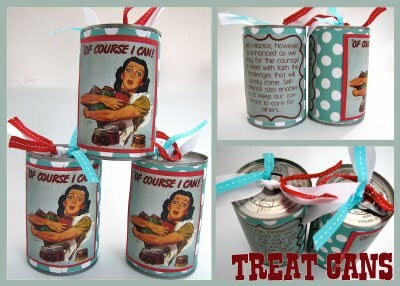 I've done these cans before as a Visiting teaching treat for my ladies. and here's where I learned to do them. What you do is cut off the bottom of the can and empty and clean it out then refill it with treats and reseal the bottom back on. Be sure to use pop top cans and for the lesson I would find the small cans, like lunch snack size. May your cupboard be filled with CANS!! 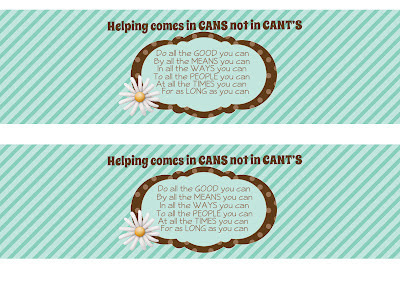 * Updated 7/26/12~ I've created a can label that should fit the small fruit cans. If it's too big just trim to fit, too small and you can back it with a solid paper first. * update~ I've added a new label because the white writing is too hard to see when you print them out. It would be cute to attach this little parable to a cute wooden spoon. 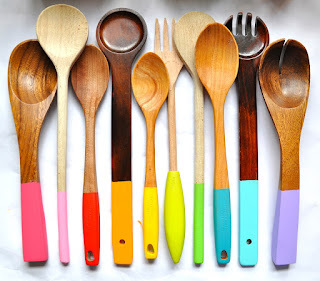 I found some ideas for decorating a wooden spoon. Just dip the handles in bright colors. you could also use some ribbon and twirl it around the handle. 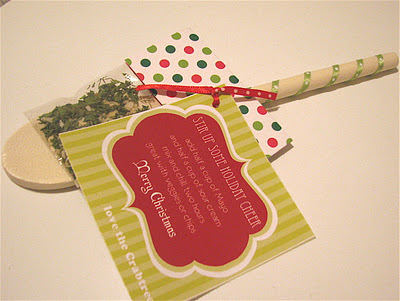 This is a spoon I made for a Christmas treat and you could see that you could attach the story and maybe a little treat. 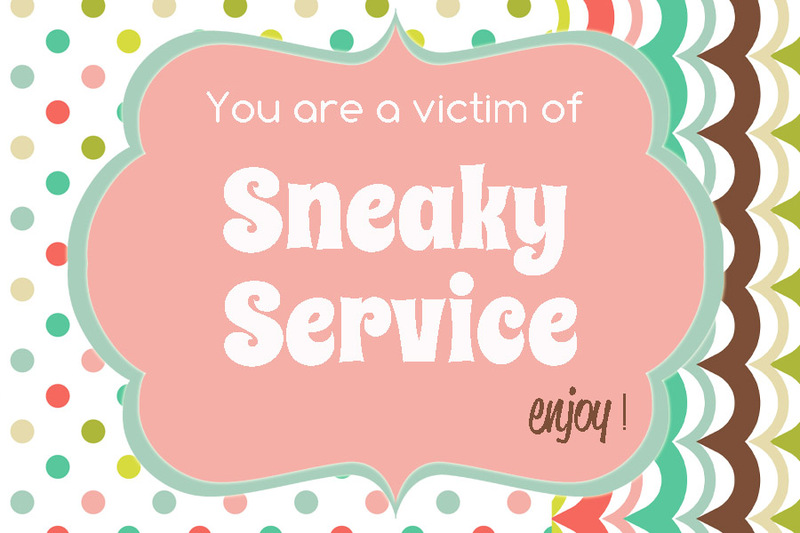 A great object lesson on how we give our service, is it with a grudge or with a smile? Display nice cake. Ask who would like a piece. Sometimes no one will take a piece as they smell a rat! I'll then cut a nice piece for one of the leaders - given on the china with a nice napkin and fork. They usually tell me how tasty it is and then the girls all want a piece. 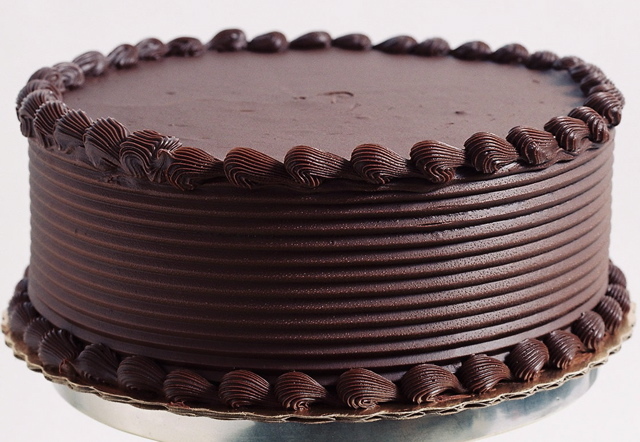 I then slash a hunk of cake off ;and toss it in the paper napkin squishing it a bit and handing it over without a smile. The object is how it's how we serve not what we serve. The cake is the same cake but tasted so much better when served in a kind thoughtful, manner. I've actually seen this done and it leaves a big impact. 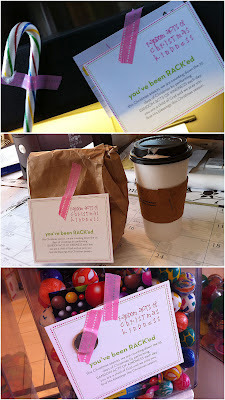 There was also this great idea of leaving a calling card after you've done an act of service. I've made up a card you can print out and give a few to the girls to leave behind after they've done a good deed. 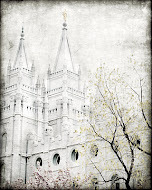 I also have found some great sites with ideas for service. 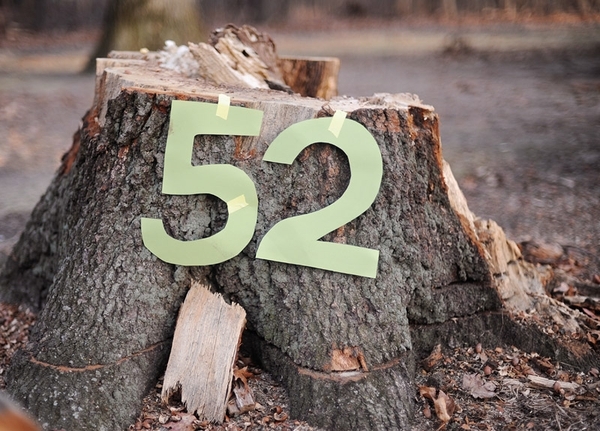 This one has 52 great ideas. I would print out the list and give it to the girls with the sneaky service calling cards. I always like to break up the lesson a bit with a video so they can hear someone else testify to what it is I'm trying to teach. This is a great video by Pres. Monson that I would use. 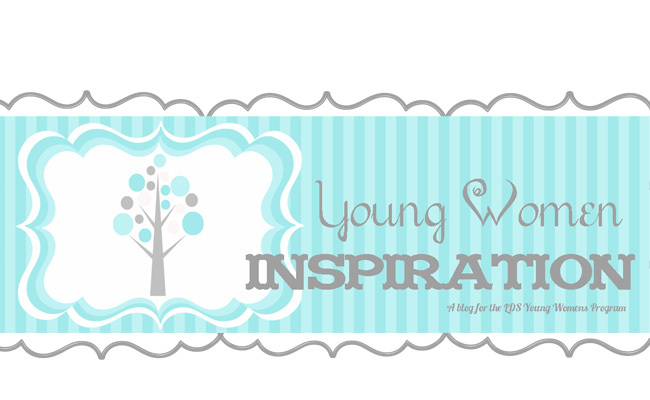 Definitely read the additional resources on the side bar of the lesson, so many good talks to take from. Hope I was helpful and please don't feel you need to do it all just take what works for you. You have a talent to take things and enhance them and make them more fun and exciting and I so so appreciate you taking time to put these ideas up so I, and many others I'm sure, can benefit. Thank you! Thanks so much!! 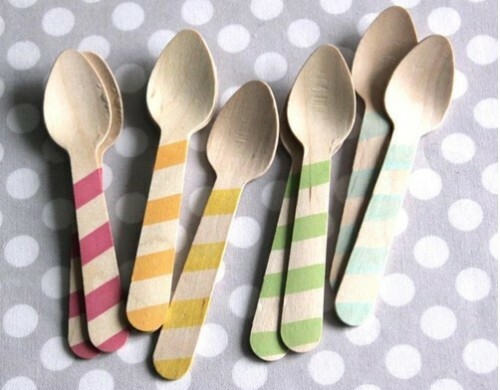 I was trying to get ideas for my lesson this weekend and a friend pinned this on Pinterest, this will help me and can't wait to something fun for the girls!